I'm sure you've seen this layered look on almost every fashionable human being and if you're thinking about trying this trend then the only question you have to ask yourself is: how many necklaces is too many for you? Whether you're a silver jewellery kinda girl or a gold jewellery kinda girl, pick your poison and get ready to stack 'em up! For once, it's the more the merrier and the better it will be. A decked-out neck will elevate your style and make you feel like a million bucks in no time. Don't mind the one lonely lavender polish I have on my pinky nail but this neck situation is what I've been rocking for the last week. 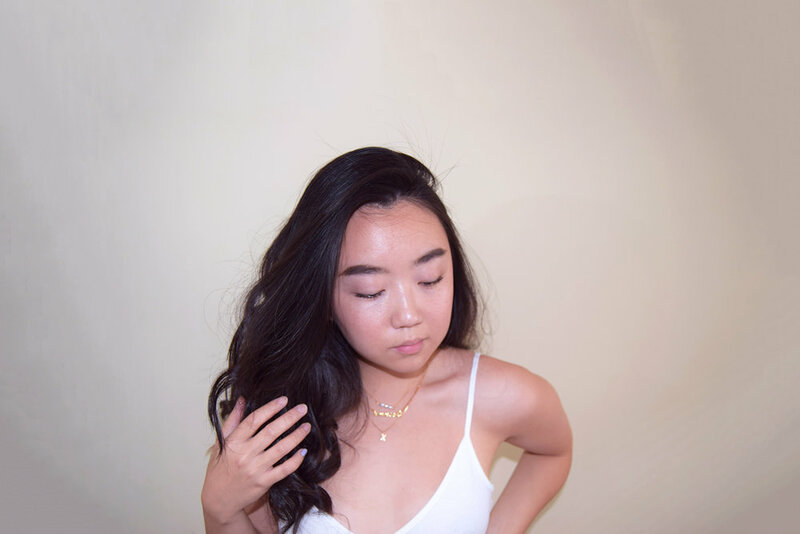 If you scroll through my Instagram you'll see that I've been wearing two necklaces for the past month and now I've incorporated a brand a new addition to my ever-growing layering set of gold necklaces. Yes I know I've said this before but I'll say it again. I haven't always been a fan of any gold items because I thought it looked dated, tacky and maybe even slightly gaudy but really, they're anything but. Here I've layered two of my Etsy finds with a custom name necklace from oNecklace*. 1. A dainty gold-filled choker with three freshwater pearls handmade by Rani. I got it for £23.58 but it's currently on sale so there's 10% off! Shop Raniska by Rani here. 2. A custom 24k gold plated name necklace by oNecklace*. Originally £61.56 but it's currently on sale with 35% off so it's only £40! Shop oNecklace here. 3. 16k gold plated initial necklace from Etsy. The one I have is sold out for now but you can score a similar one here for £15. Of course, you can always cheat the system by buying a three-in-one necklace but buying individual pieces will give you the freedom to layer it however you like with whatever you're feeling. Plus you can even wear it by itself when you want to tone down your look. Hand on heart though, these three items are definitely my most worn pieces at the moment cause it just works with any outfit that I have on. Full disclosure, I even wear it to the gym when I'm too lazy to take them off!